The Boykin Spaniel temperament makes for one interesting dog. On the one hand, she is one tough cookie who can spend the entire day out hunting with her master. On the other, she’s a gentle and loving family dog who loves to cozy up to her family when the long day is through. The Boykin Spaniel dog originated in South Carolina as a hunting dog. In fact, she is still the state’s official dog today. Specifically, the Boykin would accompany hunters on smaller boats that would be too small to fit an average retriever. A banker discovered the first-ever Boykin when the dog approached him and tried to make friends. He liked the dog so much that he brought it home, then sent it to a friend who then cross-bred the dog with other breeds. Energetic – If you’re constantly on the go, she’ll be right there beside you. Companionable – She is just as likely to be as friendly with your friends as she is with you. Eager – She’s just as excited to play outside with you as she is to watch a squirrel outside her window. Intelligent – She learns new concepts quickly and understands what you’re trying to tell her. Trainable – Because she’s so intelligent, she’s easier to train. The Boykin is versatile in her enjoyment of activities. For one thing, she’s a fantastic swimmer. However, if you do take her swimming, make sure you dry her ears well. If they’re left wet for too long, she can develop an inner ear infection. She will easily lap you while running or hiking, as she gets tired out a lot later than you do. She expects you to continue giving her new things to do. And will look at you expectantly for another task once she has completed her primary task. When it comes to listening, she does best when you clearly establish that you are her pack leader. Once she understands that, she will be more than willing to listen when you want her to do something. She is a very versatile dog and will adapt well to whatever new environment you put her in. If your career requires you to move around a lot, she’ll be in her glory. The Boykin loves to be the center of attention, so make sure you give her plenty of extra love whenever possible. You can use the Boykin Spaniel hunting instinct to your advantage in trying to tire her out. If you already hunt, then she’s got it made. If not, setting up toys for her to hunt around the house or yard can help her scratch the itch. For this reason, keep her away from cats and smaller animal pets, like birds or hamsters. The Boykin has two sides to her personality: she can be rough and tumble, energetic and enthusiastic while out hunting. However, upon returning home she turns into the sweetest, most gentle dog around. She can make this transition more easily if you socialize her early on and encourage her to be more personable. Because of her intelligence, eagerness to learn, and willingness to please, she’s fairly easy to train. You can contact a Boykin Spaniel obedience training school if you find it too difficult to train the dog on your own. If you are up for the fun and challenge of training your Boykin then check out these FREE Dog Training RESOURCES. If you’re not a fan of grooming, then the Boykin is for you. Her coat only requires minimal grooming. A weekly brushing is more than sufficient. Bathe her when she starts to smell, or when she just doesn’t smell clean anymore. Keep an eye on her nails, and trim them when they get too long. Else, she won’t be able to enjoy walking with you if her nails are digging into her feet the whole time. 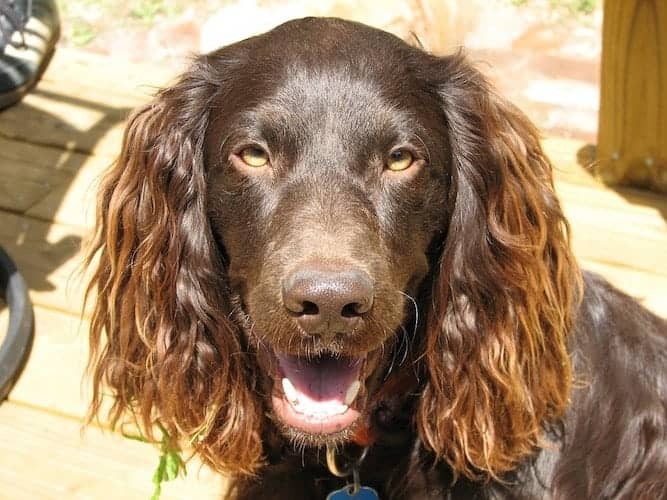 The Boykin Spaniel temperament requires that she gets an abundance of exercise every day. She has a moderate to high energy level, so do not keep her cooped up indoors all day. She loves regular exercise, like going for long walks or hikes, or running alongside her master’s bicycle. If it’s a rainy day, she’ll be happy with an indoor play session, so long as it’s lengthy. There are some health conditions that affect the Boykin Spaniel in particular. Most Boykins are healthy, but it’s good to know about these conditions so that you are aware of what to look out for. On average, the Boykin’s lifespan is between 14 and 16 years. A healthy weight for a female Boykin is between 25 and 35 lbs. ; for a male, it’s 30 to 40 lbs. So you've decided you'd like to add a Boykin Spaniel puppy to your family. How do you make that happen? You can either go the adoption route or purchase one traditionally from a breeder. The lowest Boykin Spaniel price, depending on the breeder, is around $800. Some Boykin Spaniel puppies can cost as much as $1,500. A Boykin Spaniel for sale may be more expensive if she comes from a top-tier bloodline. If you would like to adopt a Boykin Spaniel, you may want to check your local rescue organizations and adoption centers. A Boykin Spaniel adoption will cost significantly less than if you were to purchase the dog through a breeder. However, a Boykin Spaniel for adoption is typically older and not a puppy. This is because most dogs end up in the shelter after their families, for one reason or another, couldn’t keep them. If you want to adopt a puppy, your search may take longer than if you are willing to settle down for an older dog. The benefits of adopting an older dog, however, is they are usually past their destructive puppyhood and are possibly already trained. You can also purchase a Boykin Spaniel puppy from a breeder. You just have to take care to ensure you aren’t taken advantage of. A good resource to consult is the Boykin Spaniel Club of America. There is a wealth of information available here, including a breeder directory that lists breeders that the organization recommends. When an official website backs a breeder, you can rest assured knowing the website wouldn’t risk its name for a fraud. The Boykin Spaniel is a tough hunter with a sweet center. She loves her family, including young children, but she does not do well with smaller pets. This is due to her hunting instinct, which works to convince her to go after small “prey,” like cats and birds. She’s smart and eager to learn new things, which makes her easier to train than some of the other breeds out there. They respect their master as their leader, and they will eagerly await his next instruction. As an owner-trainer, you will find these intelligent fast learners a joy to work with. Bottom line is that Boykin Spaniels are friendly dogs, and even friendlier if you socialize them early and often. If you follow our recommendations above and choose a Boykin as your next special pet, you can't go wrong. The wonderful all-round Boykin Spaniel Temperament makes things easy for you.